To receive your FREE download, click here. Anne receives many requests to post downloadable music. In response to those requests, she is now providing free harp music tracks for your enjoyment! These solo mp3s are not available on any of Anne’s CDs or on iTunes, and they are only available on this site for a limited time. This is simply Anne’s way of thanking you for your support. • Sign up for a FREE download and here's what you’ll receive: a special password to a page that contains a uniquely beautiful track of a traditional Celtic tune recorded on solo Celtic harp especially for this website. • A new track will be posted from time to time, along with a few notes about the tune. The previous track will disappear off of this website. • All free downloadable tunes on this website are ©Anne Roos, 2007 and 2010. These tracks are for personal use only and are not for sale, broadcast, duplication, or other non-approved use. Each download is offered for a limited time. For any requests for other uses, please contact Anne directly. 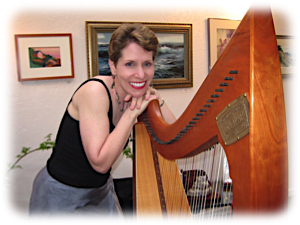 Your FREE mp3 download of Anne’s lilting harp music is just a brief sample. Listen to wedding music selections on this site, and watch her in action in her videos. Visit iTunes, Amazon.com, and CDBaby.com to sample and buy Anne’s commercially available, full-length recordings.